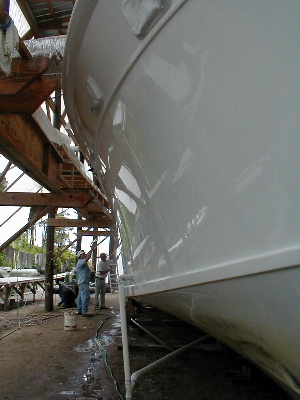 May 8, 2003 Top five reasons the Cherokee will be launched within weeks, not months – Five: the construction insurance runs out mid June. Four: several people hope she makes the splash before they die of old age. Three: FishDoc’s running out of cutesy animated webpage-toppers. Two: we’ve dodged two hurricane seasons and don’t want to chance a third. One: Julian Brown set the pilings and declares her ready to go! The words of the week are: paint and prepare! 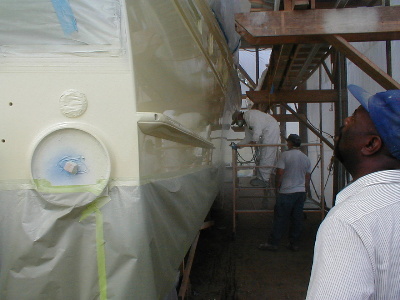 The hull has been sanded, primed, and painted with the final coat by Bruce Mallard and crew from Dockside Marine Services. 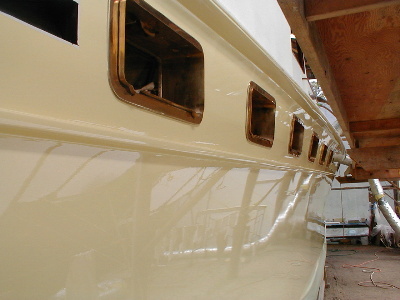 “Fighting lady yellow” suits Cherokee well – can’t wait to see the waterline and stripes! After the paint crew sanded and primed the hull, Fire Chief Blake found an effective dust-wetting system, getting everything drenched and making a lot of noise in the process. 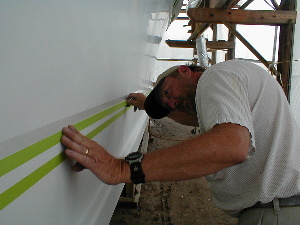 The next day the crew painted the hull to perfection. One tiny bug was stuck to the side by two legs, but was released unharmed. The painters will paint the waterline last; for now they’re prepping the deck and upper sides for white and grey paint. Julian Brown, dredger, fisherman, and philosopher, has been seizing every non-rainy day moment to scoop out the channel. He dug up lots of old stakes and parts of long-sunk boats, but in his whole career has never found any bones or signs of foul play. He recalled working with a now-deceased Marshallberger named Ham Bone who was content to live simply. “He told me he’d always be happy because he didn’t want anything. He said, ‘Julian, you’ll never be satisfied. 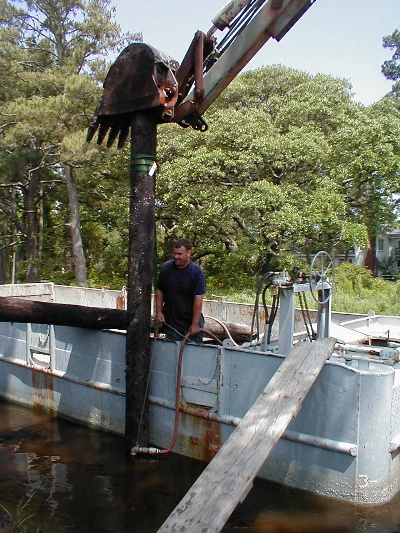 '” But Julian is satisfied for the time being with the pilings he set, because they’ll secure the Cherokee just fine once she’s launched, and meantime he can tie up his dredge there. 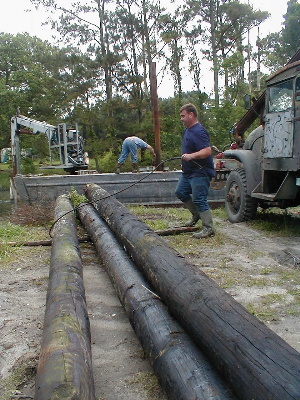 Julian and Glen Drivin’ Them Pilings! 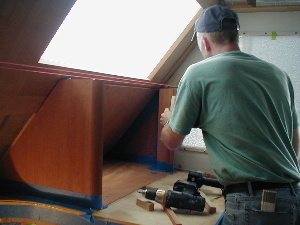 Jeanette and Chris are busy below installing hinges and trim. 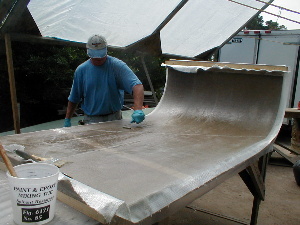 Paul, Kerry, and Bill Davis are working away on finish work, and Leonard is bending and glassing Divinicell for a flybridge seat. Follow the cricket noises and you’ll find Tom Parker happily working on galley cabinets. Whether drumming for bands with too-loud guitar players or working a noisy skill-saw, Tom always wears ear protection.